Freshman DE Noah Spence is receiving plenty of attention and praise thanks to his early practice exploits. Subtitle: biggest problem from 2011 defense addressed with a vengeance. If you had to pick the biggest issue with Ohio State’s defense last season, most people wouldn’t hesitate to mention the inability to pressure the opposing backfield and quarterback. Losing Nathan Williams to injury in the first game had a negative impact up front that lasted the entire season. Simply put, the line lacked the speed and explosion necessary to consistently and effectively disrupt opposing backfields. Fans were hoping that a superb group of linemen in the 2012 recruiting class would help address that issue, and if reports from practice are any indication, those hopes were well placed. Noah Spence in particular has stood out thus far and has received praise from fellow players, coaches and members of the media alike. In fact, Spence performed so well in Saturday’s scrimmage that he had his “freshman stripe” removed during an impromptu ceremony on the field immediately afterwards. Our friend Josh Winslow has a great set of photos from yesterday’s media day at the WHAC. Unlike past years, the players were only in their jerseys; our belief is that the University is trying to minimize any issues that may have emerged in the past regarding access to players and selling memorabilia/photos. At any rate- here are some of the “best” photos that Josh came up with… and your chance to do a bit of captioning for this year’s team. Let us know what you’d add in our comments section! With week one of fall camp almost in the books at Ohio State, the anticipation for football season is reaching a fever pitch. If you aren’t feeling the love for football just yet, read this article and get back to me. Seriously, I highly recommend that you read it (like you are doing anything important at work this Friday morning/afternoon anyway). And yes, read the whole thing- I know it’s long. 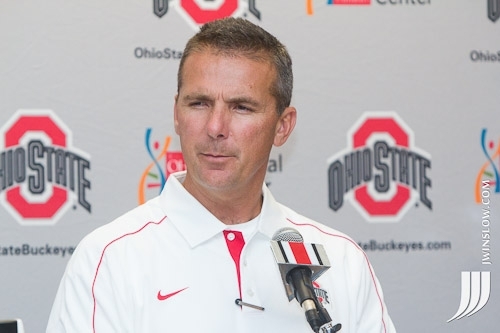 The article sets the perfect tone for the rapidly approaching Urban Meyer era at Ohio State. Bowl game or no, you have to love the direction this team is moving in under Meyer’s leadership (no giggle-f**** allowed). There is no doubt that Urban Meyer can take the team to the top, and if that doesn’t have you excited I don’t want to be your friend anymore. With that said, let’s all hope he can keep his promise to his family and maintain a balance in his life this time around. The article paints a scary picture of Meyer’s obsession with perfection at Florida. It will clearly be a constant battle for him to control that obsession in Columbus. We all obviously want the Buckeyes to be perfect each season, but we don’t want to achieve that at the expense of Meyer’s health and family life. I am optimistic that he can find the right balance. But he still felt empty. He’d ask, “Is this it?” He missed the ability to make an impact; he’d gotten into coaching to be a teacher. A challenge grew from his trip to West Point: What if he could have the feeling of Bowling Green on the scale of Florida? Ohio State gives Meyer exactly the opportunity he is looking for: returning to his Buckeye coaching roots and competing at the highest level of college football. By using that seemingly perfect situation to maintain a healthy perspective, my hope is that Meyer can continue to pursue perfection on the gridiron while maintaining a healthy lifestyle that allows him to stick around for a long, long time.